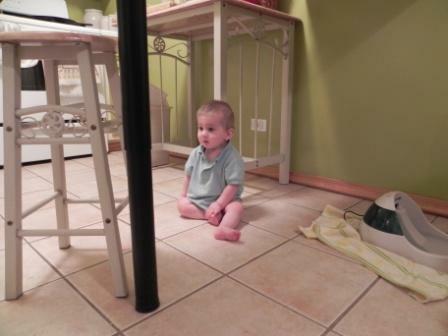 A couple of weeks before “G” started to crawl, I finished baby proofing our condo. I put oven knob covers and an oven lock on the oven, put in cabinet and drawer locks in the kitchen, put door knob covers on doors, and locked other cabinets around the house. I also put outlet covers in all the outlets, made sure there weren’t any sharp table corners exposed, and checked off each item on the baby proofing check list the pediatrician had given us. Yep, I was all set. Or, so I thought. Turns out, I forgot about a few things and my mischievous little son found them. And, like any good mother, I got out the camera when he did. 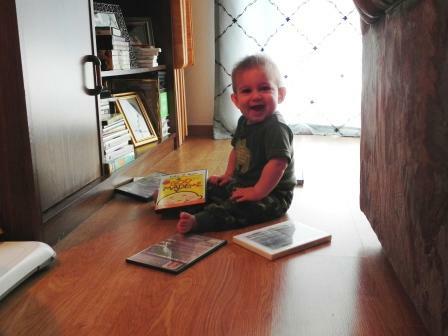 Yep, the DVD’s. He looks all to happy there doesn’t he? One thing I never thought about was the cat’s food and water dishes. Oh, my poor kitty. Not only is she doomed to be chased around by my son for many years to come, now she has to fight for her food. This was taken moments after I had to remove Diva’s food dish from the floor so “G” wouldn’t grab it. He had seen it and headed straight for it, ready to dive in. I was waiting for him to start playing in her water fountain, but thankfully, that did not happen. What else could my little monkey possibly get into? 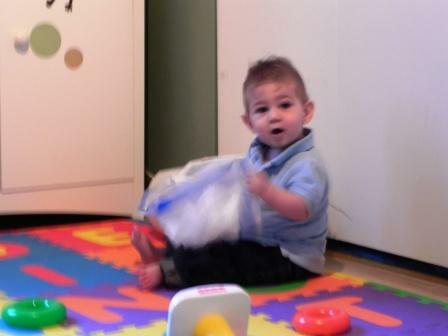 Hmmm…well, one day I left him in his room playing for a couple of minutes. You would think this would be safe. Nope. My little mischief-maker struck again. This time he had fun playing in his laundry basket. 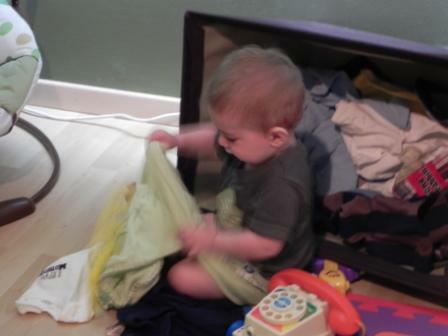 He turned it on its side and proceeded to play with all the dirty clothes. Dirty little boy. Yet again, you would have thought I would learn from the first time, but just a few days ago I decided to leave him in his room to play again. Soon enough I heard some laughing, a thud, and the sound of plastic rustling. What had my little man done? I’ve come to realize this is not going to stop anytime soon. Especially because this mischievous spirit comes straight from his father. My husband is a man who once emptied the top drawer of my dresser and filled it with packing peanuts. A man who put a rubber band around the sprayer on the kitchen sink and soaked his mother with water when she turned it on. He then did this a few years later to my mother and sister. I could go on, but I think you get the picture. Looks like I’m going to have my hands quite full with this little guy!